Congo Monkey Spotted Decades After Species' Alleged Demise : The Two-Way Bouvier's red colobus monkey — thought to have disappeared for good from the forests of the Democratic Republic of Congo sometime in the 1970s — has been photographed by two researchers. Mother and infant Bouvier's red colobus monkeys in a first-ever photograph of the primate taken in the Democratic Republic of Congo. The species was thought to have gone extinct in the 1970s. Welcome back, Bouvier's red colobus monkey. It's been a while. The African primate hasn't been seen since the 1970s and was assumed to have become extinct. But, in a statement released late last week, the Wildlife Conservation Society says two primatologists working in the forests of the Republic of Congo were successful in a quest begun in February to confirm reports that Bouvier's is still out there. They returned with a first-ever snapshot of a mother and infant. "Our photos are the world's first and confirm that the species is not extinct," Lieven Devreese, one of the field researchers, was quoted in the WCS statement as saying. 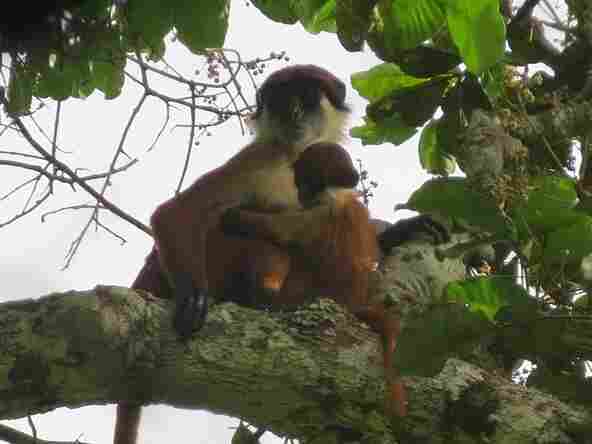 Live Science says: "There are several species of red colobus monkey. Until now, scientists only knew of the Bouvier's red species from a few museum specimens collected more than 100 years ago." According to WCS: "The small primate lives in groups in swampy forests along the Congo River, in the Republic of the Congo. Hunting and logging decimated its population, leading some scientists to suggest the monkey was extinct." The society notes that in recent surveys (in 2007 and 2014), audio recordings thought to be Bouvier's red colobus were made in Ntokou-Pikounda National Park, "but they were very rarely encountered and no photograph had been taken. "The new sighting and photograph confirm the presence of this threatened primate in Northern Congo. However, red colobus monkeys ... typically do not flee from humans but look down at them from the trees, an unfortunate behavioral characteristic that has led to them becoming very rare wherever hunters are active," the statement says. As NPR reported in 2012, another monkey, new to science but known as the lesula to locals, was confirmed in the Democratic Republic of Congo.